The day is here! 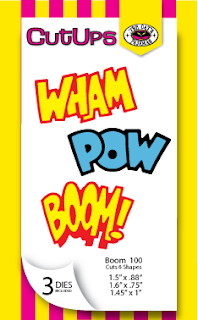 It is preview day for the Your Next Stamp May Release! Every month these releases get better and are on point with the trend. Super cute images as always and super fun new dies to boot. For my preview today, I am using the new set of Little Notes and the coordinating die set. 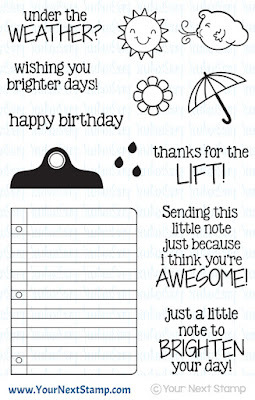 Perfect to make simple, quick cards to give that someone special a pick me up. I started with a white base and some patterned paper from AC. The main panel was cut using the YNS Stitched Rectangle die set with the clipboard popped up in the center. 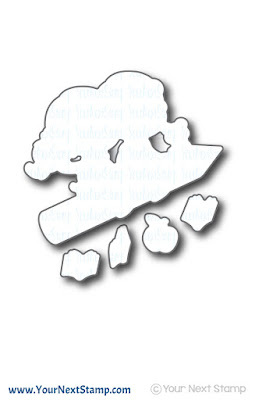 To create the clip, I heat embossed a small piece of white card stock and then cut the clip out using the die. That too was popped up for a more realistic effect. I stamped the sentiment askew directly onto the "paper" and completed the look by adding some patterned paper corners and fun new gumdrops soon to be released. You don't want to miss out on tomorrows new release blog hop for your chance to win a YNS gift certificate and special sale for you to purchase all your favorites!! Thanks so much for stopping by and be sure to check out the YNS Blog to see all the fun peeks the DT have made. It's release day at The Cat's Pajamas Stamps! By now, I am sure you all have your lists ready for all the stamps you are ready to purchase. Keep in mind that with your $65 purchase, you will get the Sending Cut Up for FREE! As with every release, we have a blog hop to celebrate and we are kicking it off on JULIE'S Blog, so be sure to start there. With this hop, we also have the first day of our Flowers challenge. 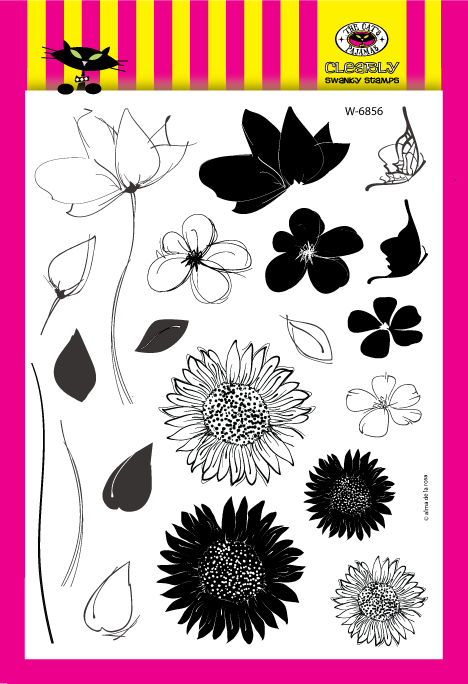 For my card today I am sharing with you one that I used the new Sketchy Flowers set for. This set is perfect for water coloring, so I couldn't resist making a card using water colors. I started the base using some Canson watercolor paper. I then used my distress inks on an acrylic block to be mixed with my brush saturated with water to run over the entire panel. I quickly dried it with my heat gun before stamping the flowers. For that, I brush water over the stamp before stamping my distress ink pad around the petals and used my distress stains to dab the center of the flower and then stamp onto the panel. Again, quickly heat dried it before I sprayed it with white picket fence distress inks and dropping a few drops of water onto it. Using the new 'Sending' cut up, I started with that for the sentiment and stamped the sunshine directly onto the panel. It was then finished with some pearls for a little bling. Next stop: Sandy's Blog. Thanks for stopping by and hope you have a great Tuesday! It's day 7 here with the sneak peeks of the soon to be release TCP Stamps! How did you like them? Are they not just the most fun and beautiful at the same time? And the Kitty Cat Pack have outdone themselves to showcase all the sets this week. Today's sneak is the Square Stamp Cut Ups. These are some super fun dies that are so versatile. 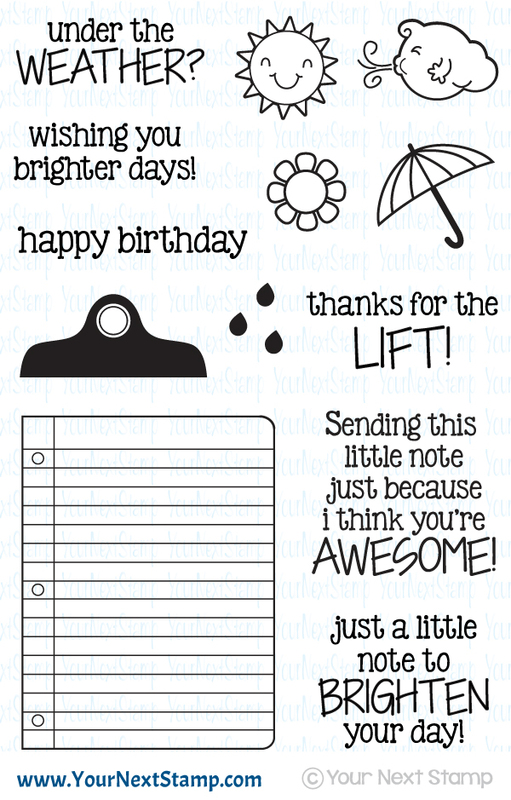 For this card, I used the new 'Sending' die to start the sentiment and the fun set of Sending You for the image. I used the smaller letters in the set to place as if it were flying out of his satchel as he scooted by. The card was completed with some fun buttons and enamel dots. How cute is bunny on a scooter? :) He always just makes me smile. Be sure to stop by the TCP Blog to see all of today's sneaks. You will not be disappointed as the Cat Pack have made some fabulous creations. And don't forget to join us in the Spring Blog Hop for some awesome inspiration and prizes! Today is day 6 of sneak peeks with TCP Stamps! And today is a beautiful set with so many options of what to make with it. This set is called Sketchy Flowers. To make this card, I used heat embossing on white card stock and colored around that with Copics for the colored background. This technique is one I saw a while back that I wanted to try and this set was perfect for it. 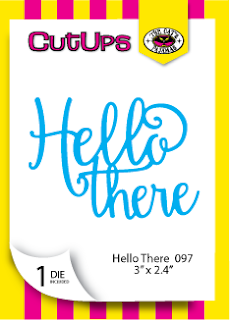 This CAS card was finished by using the new die 'Hello There' to add the sentiment to the image. I wanted the sentiment to be the same color as my embossed flower, so I heat embossed a large area with the same color and then cut out the sentiment from that. For the back panel, I used my decorative scissors for the postage stamp edges and completed the look with some rhinestones. Don't forget to stop by the other DT blogs and leave a comment this whole week during the peeks for your chance to be In It to Win It! Also, don't forget to join us for both the PJ Party on Facebook to kick off the new release, followed by the Blog Hop! You won't want to miss out on the fun and prizes! Here is the link to the FB page to join in. Hello crafty friends! I hope you all having a great weekend. Today is April's Feature Day with the DT of Your Next Stamp. This month's theme is to create a scene. There are many,many sets that are perfect with this theme. The paper is one I have had in my stash for quite some time. I cut it to frame out a chalkboard and heat embossed with white embossing powder the sentiment. The book and apple are stamped using a Palette New Canvas ink pad. The card was then finished with some Holly Berry Gumdrops. Be sure to stop by the YNS Blog to peek at the other wonderful creations the team has done. And don't forget to leave a comment for your chance at winning a stamp set of your choice! Thanks for stopping by and taking a peek! Have a great Sunday! Today is a new challenge on the YNS Blog and it is a super FUN sketch and the color inspiration screams Spring! 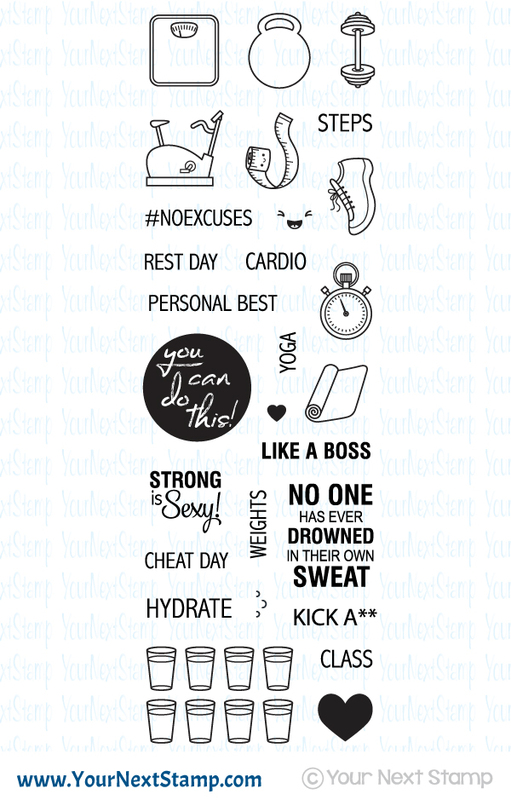 For my card, I am using the new Fitness Planner set. I thought it would be a fun set to make an inspirational card for that work out friend who may need a little lift to keep going. 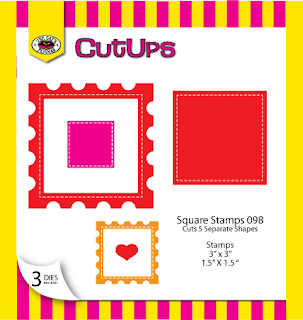 Using the Cute Alpha Squares die, I used three of the squares to stamp with different images before popping them up over the patterned paper from EP. 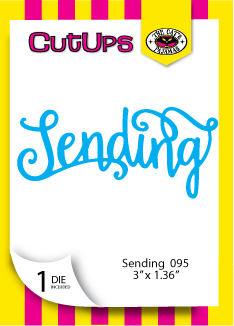 The sentiments were then stamped directly onto the base and finished with some fun gumdrops. Be sure to stop by the YNS Blog to see all the wonderful creations some of the DT members have made. Thanks so much for stopping by and hope you have a great weekend! 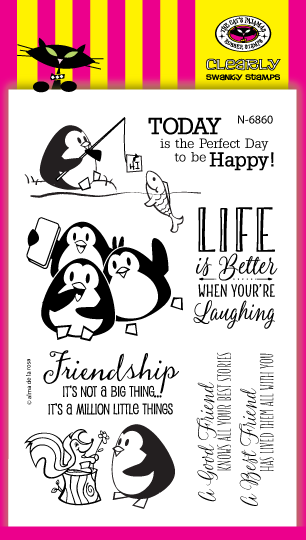 Sneaky Day 3 today and it's the favorite penguin friends you have come to love with TCP Stamps. This one is called Friendship and they are adorable. For this card, I started with some fun fish patterned paper before layering it with a panel cut out using the He Said She said die. I stamped the image directly onto the panel and used my Copic multiliner pen to extend the water and land. It was then colored in with Copics. Some of the Stitched Clouds were added to the sky and finished off with some enameled dots and the sentiment stamped directly onto the panel. Today is sneaky peek day one for the April release of The Cat's Pajamas Stamps! You are going to love all the new sets being shown this week so be sure not to miss a day. You can find all the sneaks at the TCP Blog here. 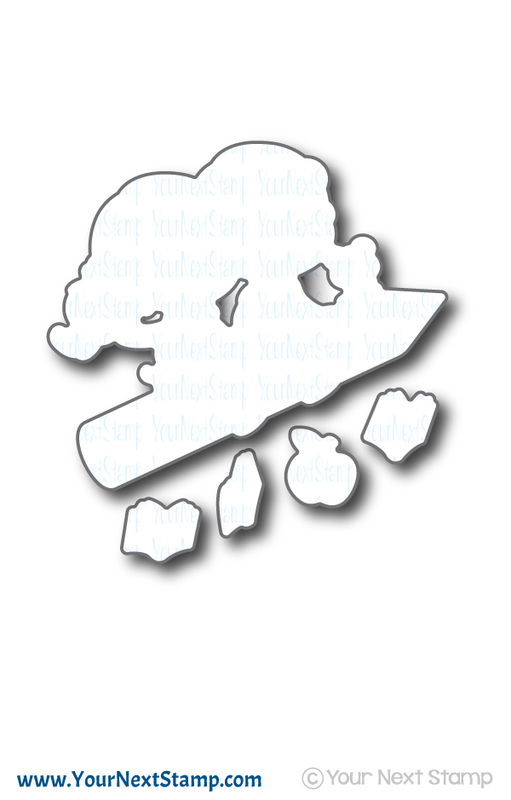 Today's sneak is the set My Hero. 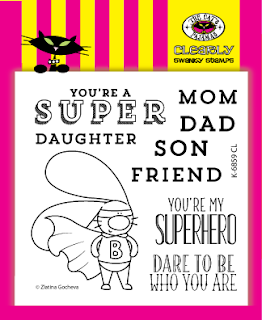 This set is so versatile and perfect for all your hero's in your life. For my card, I created one that I can give my son on a day that perhaps he is not feeling like a superhero. How fun are these dies that coordinate so well?! I started with using the He said She said die to stamp the image on before coloring it in with Copics. Using the new dies, I layered those next to the image for some added exclaimations and stamped the sentiment directly onto the patterned paper. The card was completed with some silver adhesive dots. These are going to be so much fun to play with. You will have to add them to your list this release! Be sure to stop by the TCP blog to see all the sneaks today and hope you have a fantastic Tuesday! It's time for a new TCPTUES challenge and this new one has everything to do with "Wings." Such a fun challenge and there are many TCP sets that can play along with this challenge. Have you played along with us yet? Below are the guidelines and you will certainly not want to miss the fun! For my card, I used both Birds on a Wire die and Take Flight stamp set to create this sunset like scene. The background patterned paper is one from Basic Grey's Soleil collection. I popped up the center panel with the birds on the wire behind it. I stamped a bird from Take Flight and cut out the with Bird Friends die set to be placed at the top. The sentiment was stamped directly onto the panel and the card was completed with a few rhinestones. So here are the details of playing along and we hope to see your beautiful creation linked up! Thanks so much for stopping by and have a great Tuesday! Each day this week, the DT for Your Next Stamp will be sharing ideas to inspire you for some fun and cute gifts for Teacher Appreciation week. These cute gifties that you can make will make that special teacher smile and know he/she are appreciated for all their hard work and dedication to your student(s). Today is my day to share with you my gift idea that is actually Pinterest inspired. I loved the idea of doing something fun for a teacher with this idea. It is a dry erase board using a picture frame as the board. How fun is that?! Using the new YNS release set of Learning is Fun, I heat embossed the sentiment directly onto the frame using some white embossing powder. For the accent apple and book, I stamped, colored them with Copics, and cut them out with the coordinating die set before popping them up. The inside of the frame is basic writing paper which I cut to size along with a piece of white card stock as the backing. This gives a great school feel and lines when writing on the board. I used the YNS Banner die set for the tag stamped with another sentiment from Learning is Fun and a little ruler ribbon piece. I finished the look with some twine wrapped around with a dry erase marker. This gift is very inexpensive to make and one a teacher will come to love. This is only limited by your imagination and could even be changed to match any gift idea you need. I hope you enjoyed this simple gift and I thank you for stopping by. Be sure to stop by the YNS Blog to see other fabulous ideas the team have put together. Be inspired!! 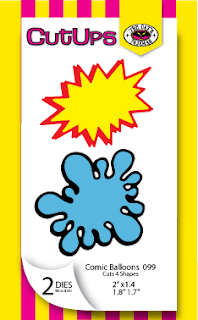 It's another Friday Challenge with YNS and I created a card using the sketch, but a little loosely. I wanted to ink up my new fun Scribble Fun set and just turned the sketch around and made it rectangle instead of oval. For this, I inked up the background in a rainbow style using my MISTI to ensure the same stamped position each time. Once that was complete, I inked the entire background with Versamark and put clear embossing powder over it before heating it with my heat gun. The sentiment was stamped and also heat embossed in clear before I fussy cut the sentiment to be popped up over the background. Some fun gumdrops were used to complete the look. For my card, I have created one using the cuteness overload Waddles to the Rescue set along with the coordinating dies and the new release Puffy Cloud Border die and the fun Stripe-tastic Edge stamp. I started with using the new Stitching and Piercing Die set to create the center frame. Using the Stripe-tastic Edge stamp, I created the background with 3 different colors before attaching it to the backside of the circle cut out. Waddles and the dog were colored with Copics before cutting out with the coordinating dies and popping them up. The card was finished with the sentiment stamped directly onto the front panel and the look completed with a few gumdrops from the Cupid Collection. Be sure to stop by the YNS Blog to see all the fab creations from the team! Thanks for stopping by and taking a peek and have a great Wednesday!! It's time to hop with the YNS DT for this months new release! You will not be disappointed, so be sure to have your own and paper ready to jot down all those sets you cannot live without! For my first project, I am using the new Plan to be Fit set perfect for keeping your fitness goals in check. This was certainly a bit of a challenge for me as I am not one to use a planner, but I can see how you would want to have a fun planner to make just yours. I love how it comes with your glass of water reminder for your daily intake. This planner is one for a weekly tracker rather than a daily one. I did add some washi tape and gumdrops to make it a bit more fun. For my second project, this card is using the Learning is Fun set and the coordinating die set. As always, Karen has a generous new release sale to share with you. It makes shopping much more fun and you don't have to think twice of which set to get! Be sure to hop for your chance to win a $25 YNS Gift Certificate! Thanks so much for stopping by and hope your weekend is wonderful!